1 bedroom luxuary log cabin nestled in the forest, 5 min. walk to the beach. 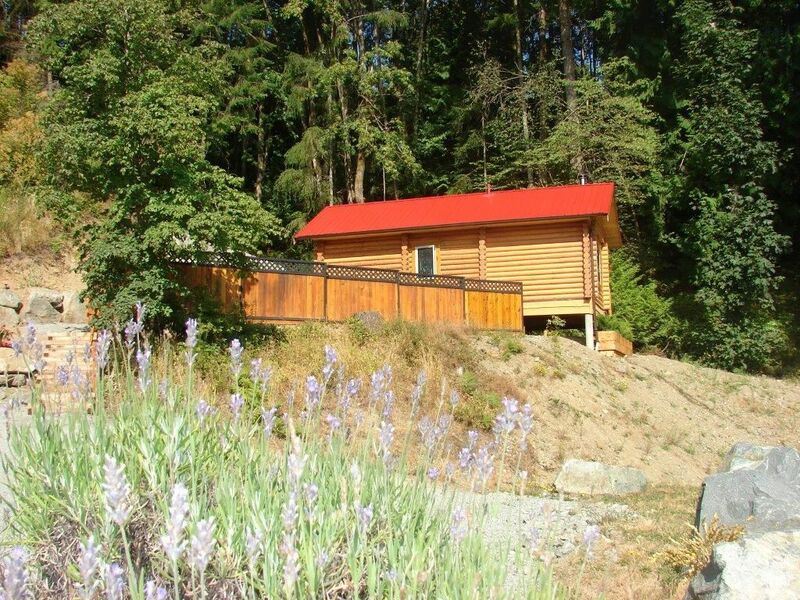 Situated in the heart of 'Wine Country' on Vancouver Island in British Columbia, Canada our one bedroom custom built log cabin is nestled in the perfect place to kick back and relax after a day of exploring the Cowichan Valley. Guests will revel in the serene ambiance of the cabin done entirely in Douglas Fir and rustic red cedar. Situated on a hill surrounded by lush green forests, the cabin is only 5 minutes walk from the beach. This 450 sq ft cabin features a separate bedroom that has a large king size bed that looks out through French glass doors into the forest. A gorgeous contemporary living room furnished with a large comfy couch, a wood burning stove and a small kitchenette to prepare meals should you wish to dine in. The bathroom is the showpiece of the cabin with slate tiles, a large clawfoot tub, rain shower and stunning aromatic cedar walls. Cabin on Paradise is a destination in itself for those wishing to “get away from it all.” Relax by a roaring fire while sipping a glass of local wine. Sit on the deck and watch the bald eagles fly overhead. Go for a walk on the park trails that start from the cabin’s front door or read a book while you revel in the silence that envelopes you. We are a Canadian / German family living in the beautiful Cowichan Valley for over 10 years. We were drawn to the valley because of it's beautiful nature, the diversity of it's culture and the healthy lifestyle it provides. The bathroom is the showpiece of the cabin with slate tiles, a large clawfoot tub, rain shower and stunning aromatic cedar walls. We are located approximately 45 min north of Victoria in the rural area of the Cowichan Valley. We are approximately 10 minutes drive from Cowichan Bay village and the ocean is only a 5 min walk. Comfy couch which looks out the french doors onto the deck and into the forest. Propane BBQ with gas burner is provided on the deck. As well there is an electric hotplate one can use inside the cabin. A convection / toaster oven is provided. Coffee, tea, sugar and spices are provided. A full set of dishes and utensils are provided for meals. Small table provided by the window in the living room. Patio furniture provided for meals outside during nice weather. Docking Station for your android / iPhone provided. Sunny area behind the cabin to relax and enjoy the garden and the nature that surrounds you. Kayak tours and rentals available in Cowichan Bay village which is located about 5 km away. Sit on the deck and watch the bald eagles fly overhead. Cowichan Lawn Tennis club located about 5 km away. Arbutus Gold course located only 5 km away. While we do not provide cable TV, we do provide wireless and the ability to watch TV and movies online should you wish to watch some television. The pictures don’t do this little cabin justice. It’s the perfect getaway for a couple looking to relax or even two friends/family members who don’t mind sharing a bed. The wooded stove cranks out serious heat and is such a cozy feature. The bathroom is spacious and gorgeous. The soaker tub was great. It even has a rain shower. There is a quiet, glute-enchancing trail right at the bottom of the driveway. The beautiful beach is a four minute walk from the cabin. The coffee maker works fantastically and has a hot water function. We had brought our pour over just in case but didn’t use it. There’s a large electric skillet, perfect for scrambled eggs/pancakes etc. There’s an iHome speaker with an older plug, so if you have a newer iPhone without a Jack, bring a converter so you can play tunes. We forgot our laptop at home (intended to bring it to watch a movie) but we didn’t miss it at all. The kitchenette is indeed tiny but we made it work. The bar fridge gave us ample space for groceries and some craft beer bottles. We sincerely hope to come back one day soon! We had a very relaxing 3 night stay in this cozy, comfortable cabin. We enjoyed the privacy it offered us. The kitchen is tiny, but we made it work and managed to cook breakfasts and dinners. We used the BBQ and it was great. The only thing I would say is that the lighting could be improved somewhat. There are good reading lamps in the bedroom but not enough overall lighting in that room. But other than that, it provided everything we needed for an enjoyable getaway. We enjoyed our stay very much. The cabin was very clean and beautifully appointed, however the kitchen needed more counter space and a larger sink as the bar sink is a little small for dishes and pans. A microwave would be helpful also. The drive to Cowachin Bay Village is very pretty. We also drove to Duncan which is also close. The hiking trails are great. We would recommend this property to our friends and family! Beautiful and private setting - cosy and well-equipped. The wood stove was a great treat. Even though the cabin is in a residential neighborhood it still gives you a feeling of privacy. It was neat and clean. The kitchen is tiny but we didn't cook just did cereal for breakfast and ate out the rest of the time. Our only complaints would be the steep gravel driveway which we were told about before our stay. We were in a AWD vehicle and make it ok, but sure didn't want to let off of the gas. The other thing was that the cabin was dark. Some higher wattage bulbs would solve that issue. Overall we enjoyed our stay. Nice Place small Kitchen but all for Cooking. A real House in the Forest. Clean and quiet, Perfect to relax. Featured in magazine such as Gourmet Magazine, Saveur Magazine, Bon Appetite and Harrowsmith, the culinary scene in the Cowichan Valley is not to be missed. Nestled between rivers, mountains and ocean beaches the agriculturally rich area of the Cowichan Valley is creating a farm to table culinary experience one cannot get in too many places in the world. Come to the Cowichan to sip, taste and be wowed by the many the many superb creative chefs that call the Cowichan Valley their home.